First, let’s make sure we have the equipment straight! 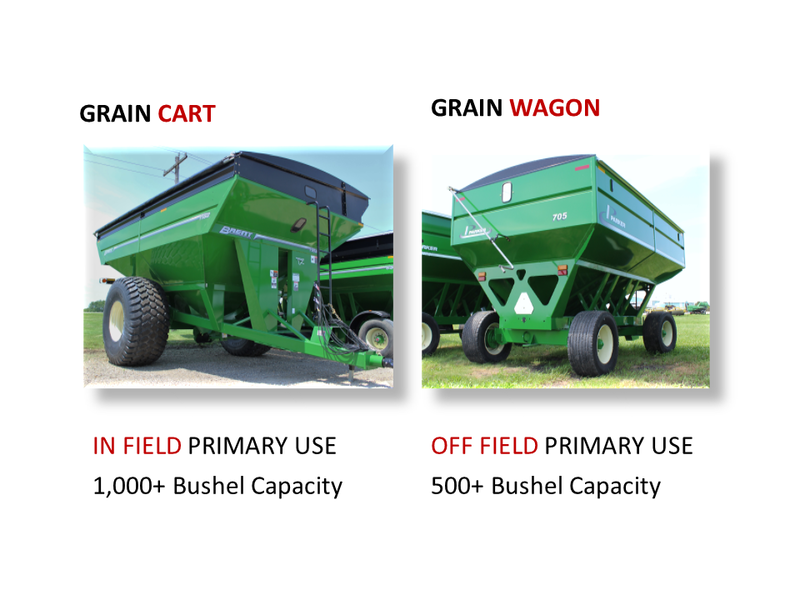 GRAIN WAGON or Gravity Wagon is used to transport grain from FIELD EDGE to grain elevator or bin on farmer’s property. Grain Wagons are used primarily OFF FIELD. GRAIN CART is used to transport grain from ALL OVER FIELD to Tractor Trailer. Grain Carts are used primarily IN FIELD. 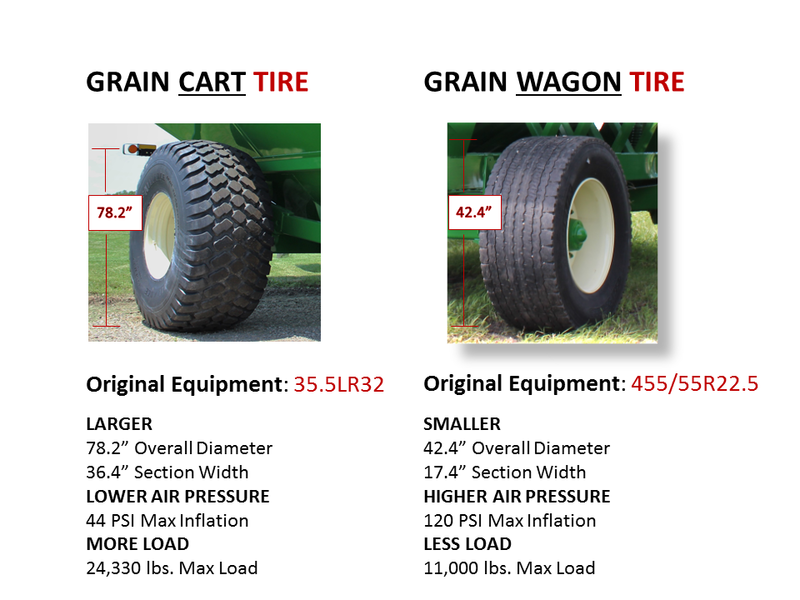 Grain Cart tires are Taller, Wider, Lower Air Pressure, Carry Heavier Load, with various tread designs suited for specific field applications. Grain Wagon tires are built on truck tire platform with more similar tread designs built for higher speeds. 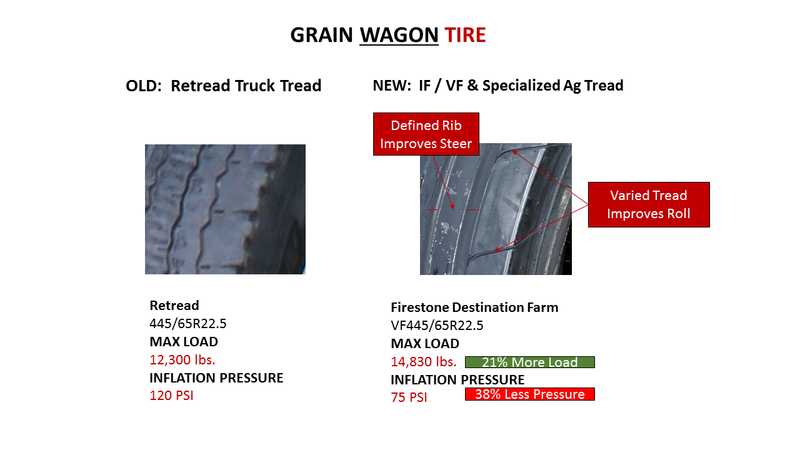 I-1, F-I, followed more recently by Retread Truck Tires have been only Grain Wagon Tire options for years. Big difference in inflation pressure! So why aren’t Specialized AG Tires more popular for Grain Wagons? 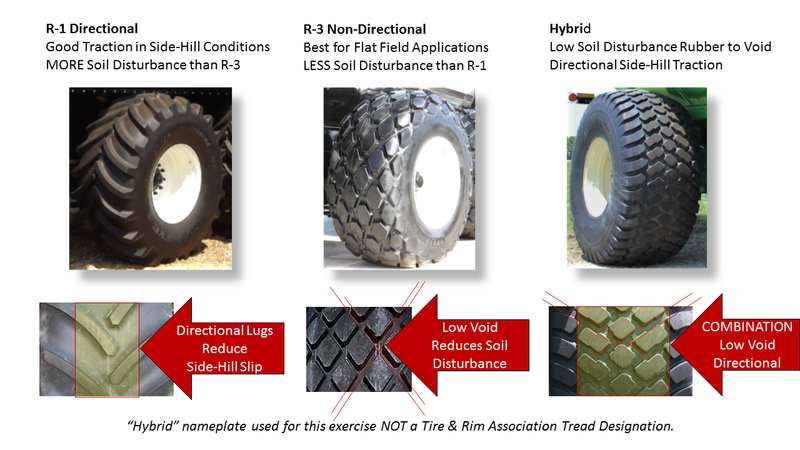 Retread truck tire initial cost is much less than specialized ag tire in application that for many growers sees minimal field use. Now the best part, Grain Cart Tire Trends……Why?? More options and ways to improve yield along with performance! First, let’s start with the basic Grain Cart Tire Tread Designs along with performance attributes. Let’s take a look at the Technical Features of one of the most common Grain Cart Sizes: 900/60R32. Means tire Load Cycles between Maximum Allowable Load and Transport Load (e.g. empty to full grain cart). Unloading must occur before road transport and maximum load may not be carried more than one mile before unloading operation begins. Cyclical Field Operation (CFO) tires are engineered to provide optimum performance in cyclic load service (e.g. empty to full grain cart). 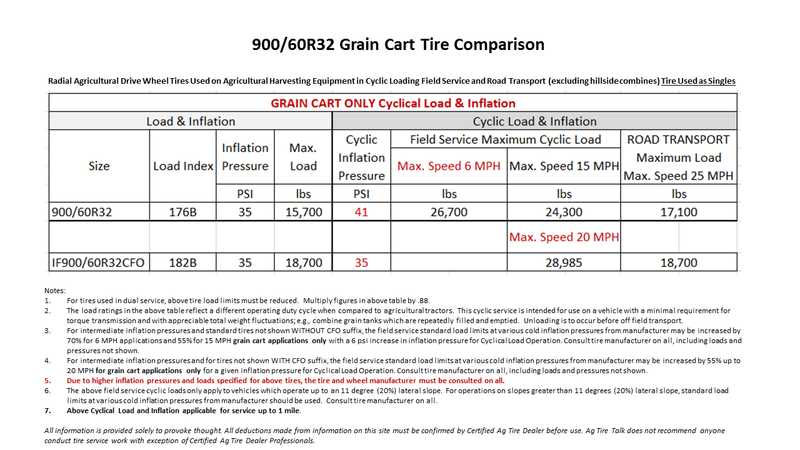 Below is comparison of Standard 900/60R32 versus IF 900/60R32 CFO for Grain Cart Use Application. So what’s the difference? Yes, the standard 900/60R32 can carry more load because of heavier Load Index, but that’s only part of the story. The BIG DIFFERENCE? Air Pressure, Speed and Weight Carrying Capacity. 900/60R32 Standard Tire requires + 6PSI for Field Service Maximum Cyclic Load. IF900/60R32 CFO requires NO ADDITIONAL AIR PRESSURE FOR FIELD SERVICE MAXIMUM CYCLIC LOAD. 900/60R32 176B Standard Tire Field Service Maximum Cyclic Load @ 15 mph = 24,300 lbs. IF900/60R32 CFO 182B Field Service Maximum Cyclic Load @ 20 mph = 28,985 lbs. Above numbers for single tire application for grain cart use only up to 20% grade, using tires compared above. Consult Certified Ag Tire Dealer before making any air pressure changes. 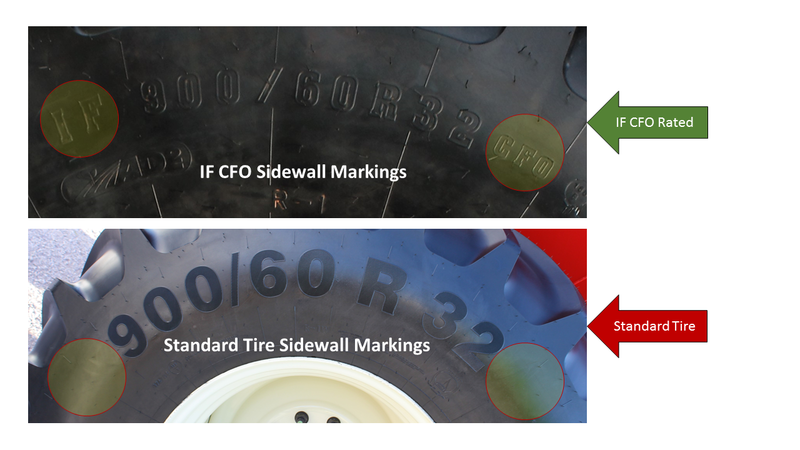 How do You tell if tire is IF CFO Rated? Look for the sidewall markings. When the chips are down in the middle of Harvest, IF 900/60R32 CFO 182B shown above delivers Field Service Maximum Cyclic Loads with no additional air pressure requirement, speeds up to 14 mph faster, with up to 4,685 lbs. more load than 900/60R32 176B standard tire we compared. Tire Technology illustrated! Special Thanks to Scott Sloan from Titan International for Technical Contribution along with Dave Henricks from Phelps Implement for application insight. Have 2013 JD gator Has 27×9-14 6 ply black rock tires can I replace with car mud/snow tires to get more mileage out of them. I will research and be in touch. Thank You for Inquiry. Yes, you can replace with Light Truck tires. Common Light Truck size that will work is 27×8.50R14. 8.5″ section width compared to original 9″ section width means tire will be slightly narrower.